16622RR in RUBY RED (NOT gray as pictured) Original list price was $455! 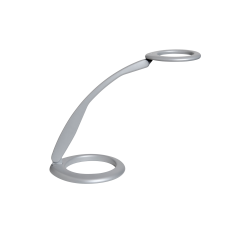 Distinctively designed award-winning LED task light with outstanding functionality. The rotating base and flexible spring-balanced pivoting arm occupy a small footprint when the task light is positioned over the base. When fully extended, the light covers a large area providing broad, asymmetric and ergonomically correct workspace lighting. 360 is dimmable and has a 9/4 hour automatic shut-off to save energy. Table/desk base mount. 360 is equipped with state-of-the-art LEDs, which provide bright, warm light and have a life expectancy of 50,000+ hours. That means 25 years or more with normal office use. You may never have to change the lightsource.